Watching the LED of a high quality soldering station blink on and off while the soldering iron was maintaining stable temperature gave me the idea. It looked like it was going on and off with regularity in a rhythm. 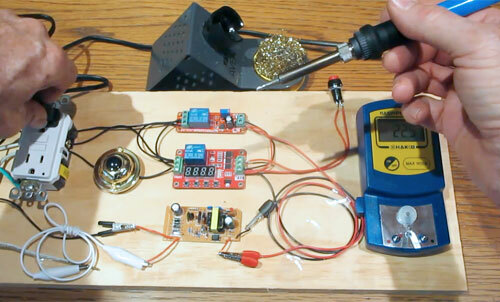 I thought, why not use a timer circuit to do something similar for a regular plug-in soldering iron? The circuit was tested in a previous post. The setup was crude, but it was good enough to test the concept. 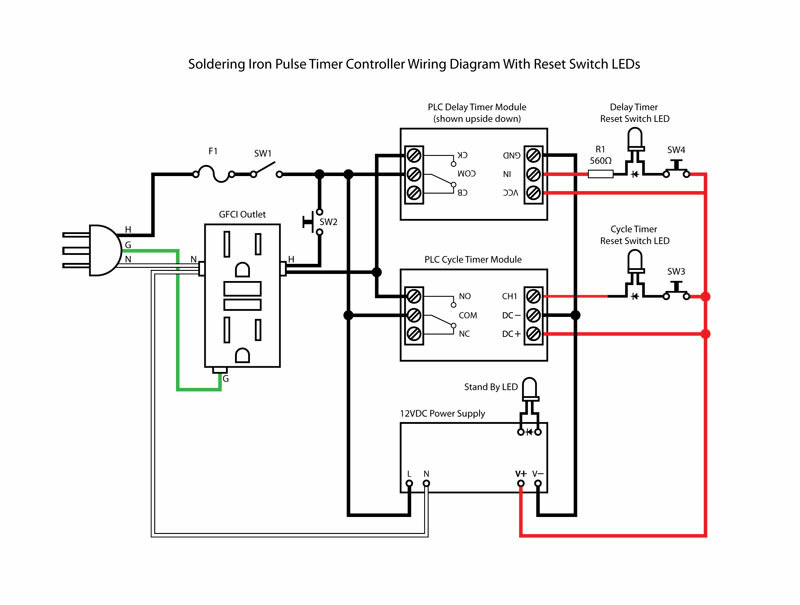 Previous test board for PLC cycle timer circuit. The delay timer for the cold start in the original test circuit was limited to 10 seconds so it was modified. The 100k trimmer pot on the PCB was replaced with a 1 meg ohm trimmer. That allowed the delay time to be set for up to 100 seconds. 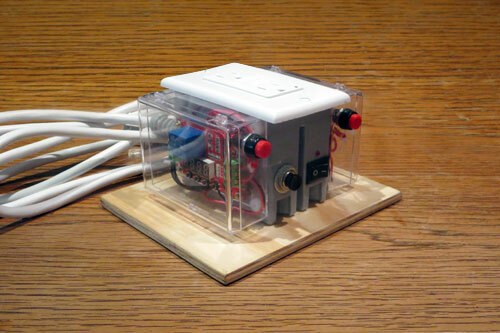 I used an on-off push button switch for each of the timer reset switches SW3 and SW4. It was hard to tell by feel when pressing the switch whether it was on or off, so I added an LED for each switch that would light up when it was on and go out when it was off. It is important to make sure that the delay timer reset switch is turned off as soon as a new countdown is initiated to prevent an accidental cold start. 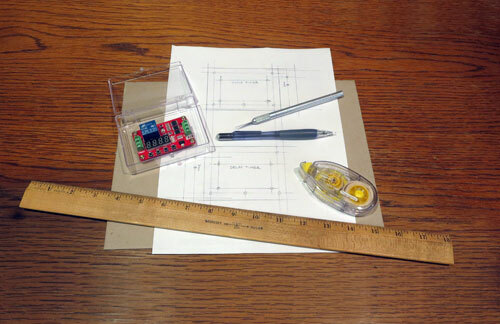 A variation of the circuit is shown below for adding LEDs to the reset switches. If the physical characteristics of the switch are such that it is easy to tell if it is “on” or “off” without an LED, then the LEDs are not necessary. The voltage across the SW4 switch for the delay timer is 12 volts, so it requires a 560 ohm current limiting resistor R1. The voltage across the SW3 switch for the cycle timer was 1.85 volts when I checked it. The voltage is very low and will barely light up a 3 mm (T1) LED. 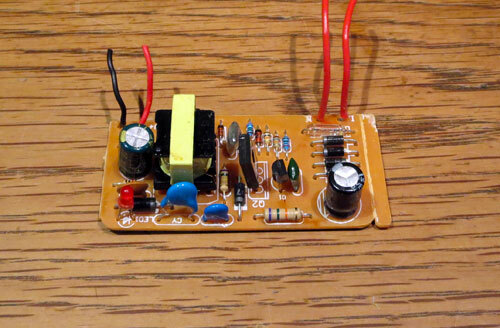 A current limiting resistor is not necessary for the SW3 LED. There are a couple of differences that make this unit safer and more user friendly. 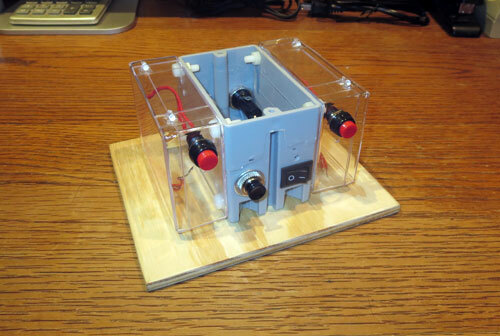 One of the problems with the old timer was that it used the normally closed relay contacts to engage the circuit. 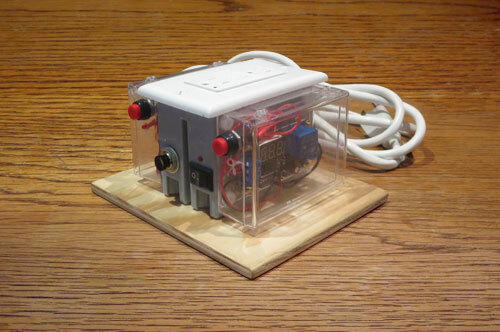 The timer would have to be powered to keep the circuit open. That was a safety issue because if there was a power interruption or a restart for any reason, the soldering iron would start to heat up again even if it was already hot. I wrote about this at the end of the previous post as one of my concerns. 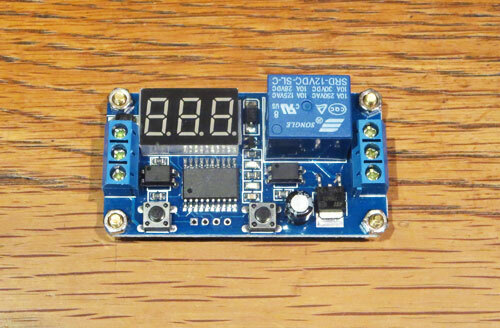 The delay timer in this new circuit works in reverse. The the normally open relay contacts are used to engage the circuit. The timer is not required to be powered up to keep the circuit open so there is no liability if there is a power interruption. The delay timer also has a control feature to start the countdown. The SW4 switch is used to initiate the countdown and once it starts, the switch is shut off. The countdown goes to completion and will not repeat until the switch is pressed to start a new countdown. The best part about the new delay timer is that it has a digital display. The buttons are used to enter the delay time in seconds. With the old delay timer I had to adjust the trimmer with a screwdriver and check it each time with a stop watch. 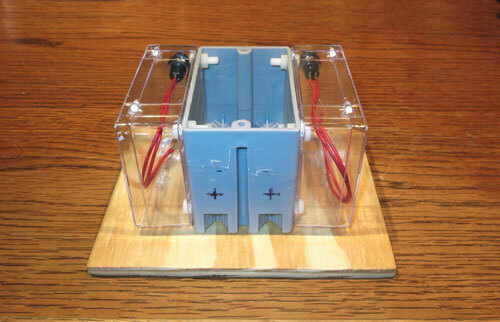 A PVC outlet box was used for the enclosure with two clear plastic hinged boxes for the timer circuits. 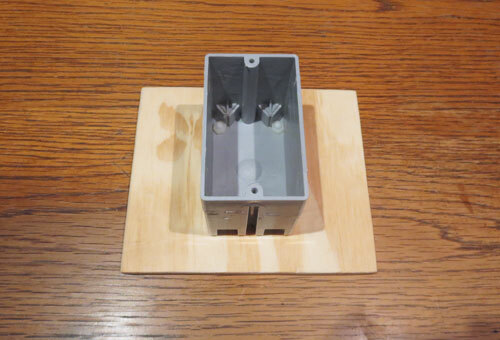 Nylon fasteners were used to secure the clear plastic boxes and plywood base to the outlet box. 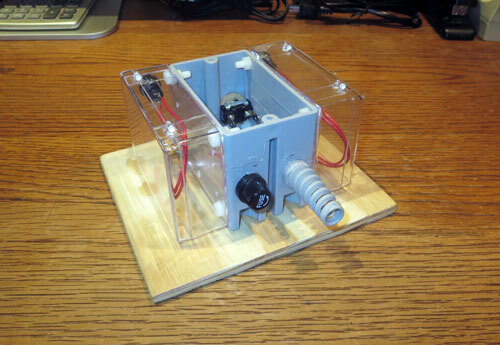 The 12v DC power supply circuit board was positioned inside at the bottom of the outlet box and secured with hot glue. Holes were drilled and the switches, LEDs, power cord and fuse holder were mounted to the outlet box. Shown below is a photo of most of the parts. On the left is a GFCI outlet and above it is a PVC outlet box (by the time this photo was taken, I had already sawed off the mounting nails with a hack saw so the sides look smooth). Search for “RACO single gang cable box with captive nails”. Also in the upper right is an 8-foot outdoor extension cord (white). 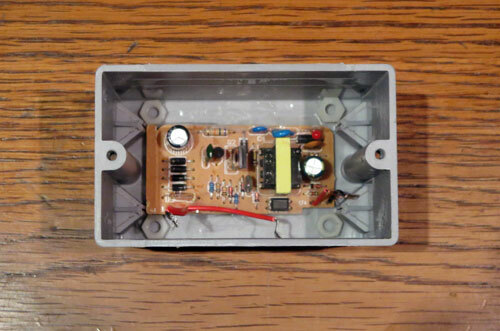 Just below that is the FRM01 cycle timer circuit, one of the rigid clear hinged plastic boxes (3 9/16 in x 2 9/16 in x 1 1/8 in) and one of the two sets of circuit board standoffs, nuts and screws. 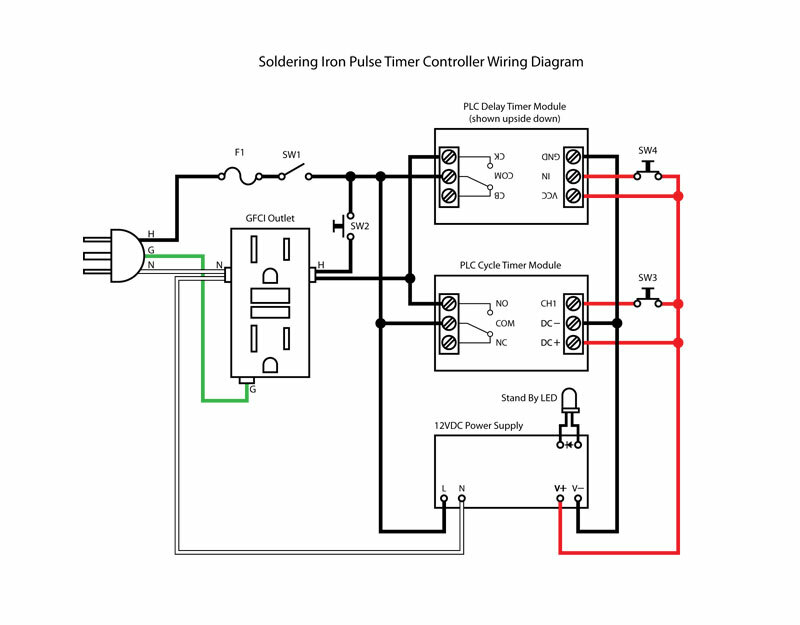 To the left of the cycle timer circuit is a pigtail strain relief bushing for the power cord. Right under that is a 15 amp rocker switch. This switch wasn’t used and was replaced with a smaller, 10 amp rocker switch instead. 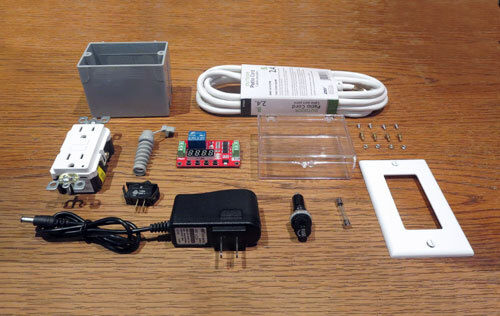 In the front row is the 12v AC adapter, fuse holder, 2 amp 3AG fuse and a wall plate for the outlet. The AC adapter was disassembled and the circuit board was removed. New leads would have to be soldered to the power supply because the existing wires were too short. Before drilling any holes I mounted the GFCI outlet and wall plate then secured the two clear plastic boxes to the outlet box with rubber bands. This was done to get a feel for how all these parts were going to come together and to take some measurements to make sure everything would fit. 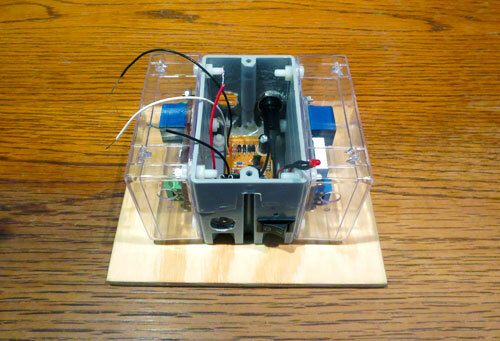 The next thing was to position the 12v power supply circuit board inside the outlet box at the bottom. It was held temporarily with clear tape. I arranged 4 nylon hex nuts as far as they would go towards the edges of the inside surfaces. 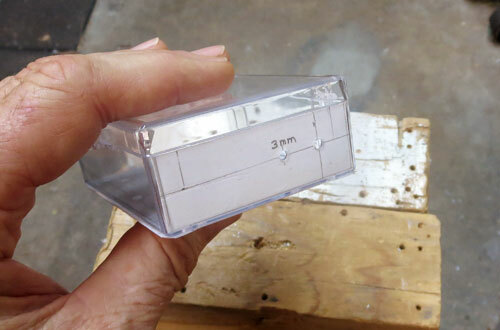 I used a power drill and a 3/16 in bit to drill the 4 holes in the bottom of the outlet box. Next, I cut a 6 1/2 in x 5 1/2 in piece of 3/8 in plywood for the base. 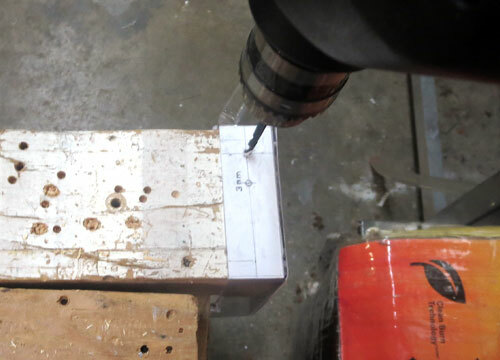 Using the holes in the outlet box as a guide, I marked where to drill the holes in the plywood. First I drilled 3/16 in holes, then counterbored them with a 7/16 in flat wood boring bit. 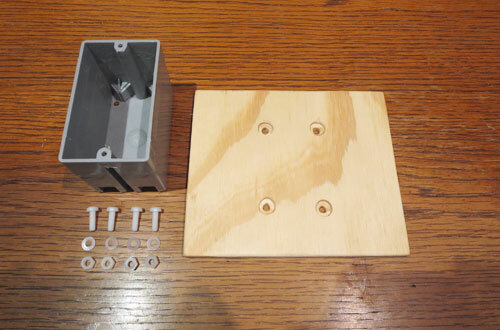 The photo below shows the outlet box, plywood base and nylon fasteners before assembly. The fasteners were metric: M5 x 15 mm Phillips head screws, M5 hex nuts and M5 x 10 mm x 1.0 mm flat washers. These are hard to find in small quantities through local suppliers, so I ordered them online. The photo below is a view of the underside of the base. The fasteners are counterbored so the base sits flush on a level surface. 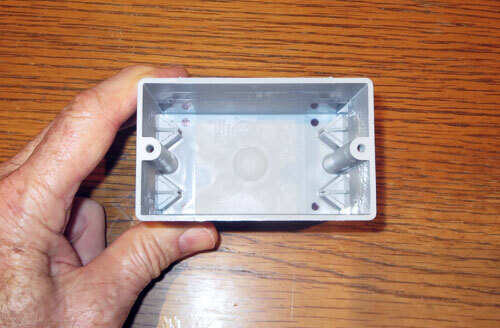 The next photo is a view of the inside of the outlet box with the base secured with the plastic fasteners. Plastic hardware was used instead of metal for safety reasons. Patterns of the hole locations for each surface were cut from the drawing with a utility knife. 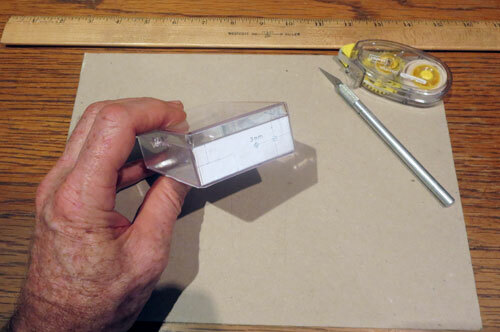 The paper patterns were affixed to the box with a roll on glue tape dispenser with repositionable adhesive. 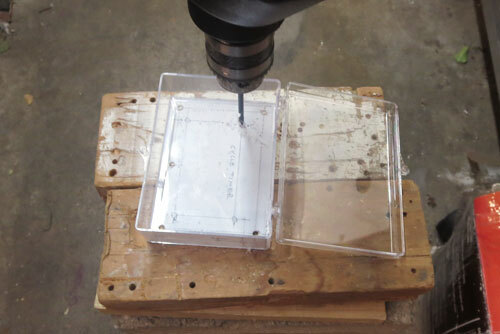 The pattern for the bottom holes were affixed to the underside of the box (photo below). 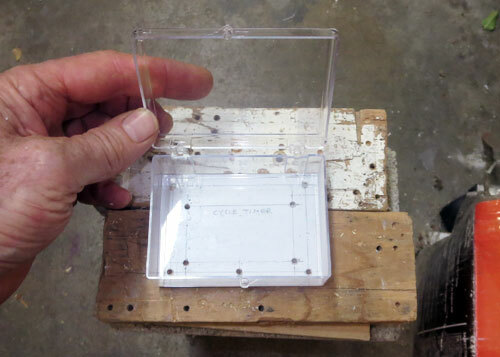 The clear plastic box is made of styrene plastic. It is very brittle and will crack easily. A fresh, sharp 1/8 in drill bit should be used. All the holes except for the 3 mm holes for the reset switch LEDs were made with a 1/8 in drill bit. I used a smaller drill bit for the 3 mm holes. 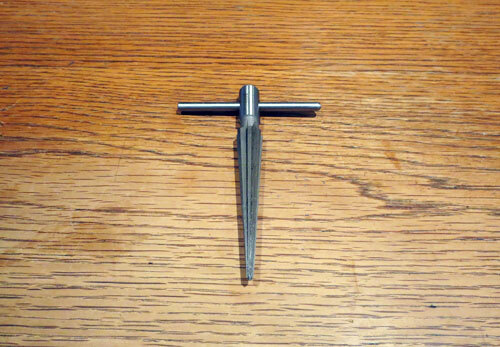 I used a taper reamer to enlarge holes where needed. I don’t recommend using a larger drill bit to enlarge holes in brittle plastic material because it can crack. 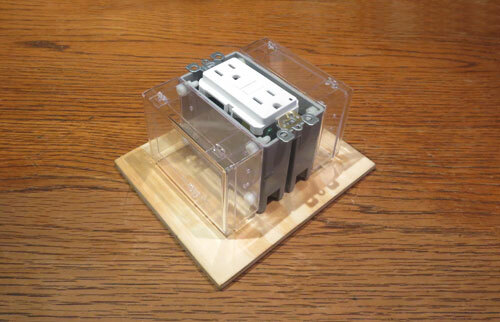 The clear plastic boxes were then mounted to the outlet box. 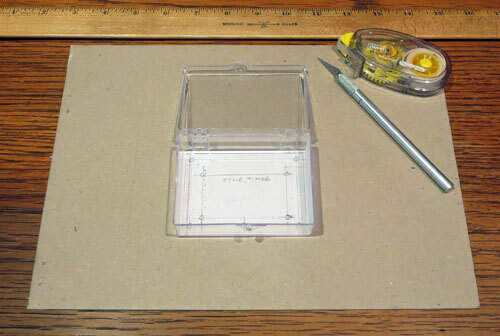 I trimmed the lengths of the four screws used at the bottoms of the clear plastic boxes with a precision utility knife so they would fit. When trimming the length of a screw, it is best if you first thread a nut onto the screw down past where the cut will be made. After making the cut, back the nut off the screw. This will clear any burs that can get in the way and make it easier to thread the nut back on. The next step was to drill the remaining holes in the PVC outlet box and to mount the switches and other parts. This was done at this stage to make sure all the parts would fit. Shown below is a view of the front. The two reset switches are mounted and holes have been marked for the warm start switch SW2 on the left and the main switch SW1 on the right. A 3 mm hole will be drilled above SW1. A view of the rear shows the locations for the fuse holder on the left and the power cord on the right. The holes were drilled and filed to shape with a round file. The rectangular hole for the switch was drilled first, then shaped with a nibbler and finally with a utility knife. This is a view of the rear. All the parts fit below the outlet. 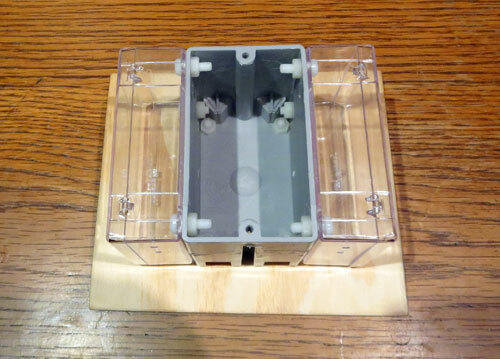 Next the switches, the clear plastic boxes and the strain relief bushing were all dismounted. 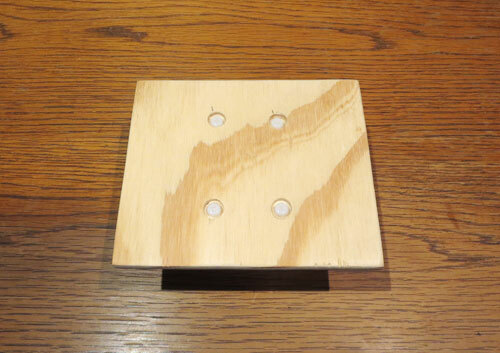 Leave the plywood base mounted to the outlet box. 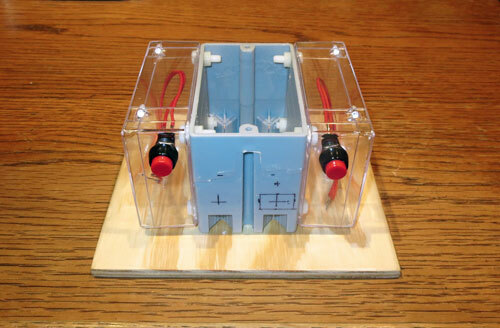 The two timer circuits were mounted to the plastic boxes with standoffs and then the boxes were re-mounted to the outlet box. I used metric standoffs obtained online. M3 hex nuts were included with the standoffs. The screws were ordered separately. Search for “5 mm body M3 x 6 mm male to female brass pillar standoff” plus “M3 x 5mm Philips head screw”. Shown below is a photo of the first stage of final assembly. The power supply was mounted first. Hot glue was used to secure it into place. The existing leads and LED were unsoldered from the PC board and new wires were used to extend the length of the leads and the LED so it could be positioned above the main switch. The red stand by LED can be seen in the above photo hanging over the lower right corner of the outlet box. It was pushed into the 3 mm hole above the main switch SW1. Whether to use glue or not will depend on how tightly it fits into the hole. If you look real closely at the photo you can see the end of one of the flat crimp terminals touching the lower left edge of the outlet box. This crimp terminal is on a short piece of wire whose opposite end is soldered to one of the contacts on the fuse holder. The crimp terminal is to be connected to one of the contacts of the main switch SW1. 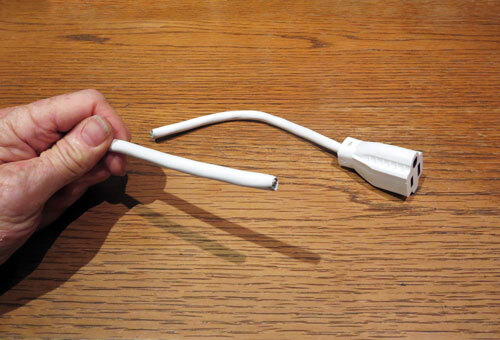 The next step was to cut off the female connector end of the power cord. About 6 inches of sheath was removed using a utility knife. Be very careful not to cut into any of the conductor wire insulation. I used a wire stripper to strip about 5/8 inch of insulation from each of the conductor wires. From this point forward the final assembly mostly involved wiring. All of the 12v wiring was done with 24 gauge stranded wire and all of the 110v wiring was done with 20 gauge stranded wire. Flat crimp terminals were used to connect the main switch and the momentary switch. 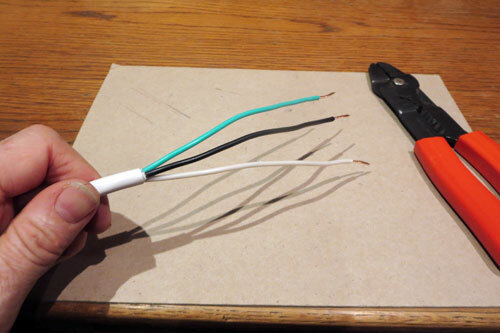 Lengths of heat shrink tubing were used on the flat crimp terminals and soldered leads to minimize risk of bare wires coming into contact and causing a short circuit. Two small gray wire nuts were used to connect the 12 volt wiring and three yellow wire nuts were used to connect the 110 volt wiring. The wiring was completed and the GFCI outlet was mounted. I did use two small 1/8 inch nylon spacers to raise the GFCI outlet a little bit off the outlet box. This was necessary for the wall plate to be flush with the clear plastic boxes. The photo below shows the finished unit ready for operation. One thing I did was to run some continuity checks before plugging in the unit. I didn’t want to see hours of work go up in a puff of smoke. I checked the continuity of the 12v lines from one timer to the other plus I checked the hot conductor inside the GFCI outlet with one side of the momentary switch SW2 and with the hot AC terminals on each of the timers. That gave me some confidence so I held my breath and plugged it in. The unit worked perfectly and I was able to breath again.